We live, simultaneously, in two different worlds. Ultimately, we live in the World of Nature, a world that we did not create and the world upon which all life depends. Most immediately, we inhabit a "human world" that we create ourselves. Because our human world is the result of our own choices and actions, we can say, quite properly, that we live, most immediately, in a “political world.” In this blog, I hope to explore the interaction of these two worlds that we call home. I was an elected official in Santa Cruz County, California for twenty years, from 1975 to 1995. Now, I am an environmental attorney, practicing law in Santa Cruz County. If you would like to contact me, send me an email at gapatton@mac.com. There are still opportunities to see The Man In The Iron Mask, performed by Shakespeare Santa Cruz, but this is the last week of this summer's season. 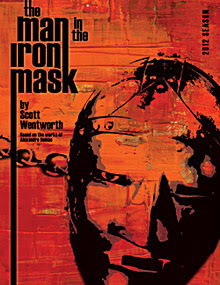 The play, by Scott Wentworth, is based on the book by Alexandre Dumas. If you saw last year's production of The Three Musketeers (or know the book or play, as many in last Sunday's audience did) you will become part of the cheering section for the now aging Musketeers, who hark back to their younger days, and to their past exploits, as they seek out a whole new historical opportunity (alas, ultimately not taken) in their quest for liberty, equality, and fraternity. One reviewer, otherwise praising the play, apparently thought that the ending was a bit too pat, aiming at an "all things to all people's politics." I, personally, was stirred. "All for one, and one for all," is still a call to the life well lived, in politics and otherwise.